These doodles appear on the back of an Upper Canada land petition. Upper Canada Land Petitions, RG 1, L 3, P Bundle 4, no. 70 (1797); LAC microfilm C-2489. Notification of an award is a momentous occasion. Receiving a prestigious award may be a once in a lifetime happening. Reasonably stable recipients do not respond to the news with a) stunned silence, and b) unseemly babbling. Dignified recipients do not happy dance to the window and shout “YAAHOOOO! !” at bemused passersby heading to the Market around the corner. To be fair, all this was before enough caffeine had percolated into my central neurons. You have to understand part of the shock was not knowing my book had been entered in the competition! Sandra Roberts of Global Heritage Press, my publisher, was much more professional; she seemed certain no-one will call tomorrow to say it was a dreadful mistake. So now I’m shamelessly blogging. The book took over five years to plan, write, research, assemble and endlessly re-write. Now it is deemed of some beneficial value by qualified genealogists. It was always intended as assistance for UEL descendants, based on my 30+ years of research encounters with their forebears in a sticky time period for sources and evidence. 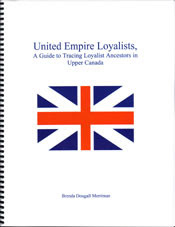 There have been so many misconceptions and misunderstandings about Loyalists among newcomers researching their ancestors and the public in general. Would you believe, I have no Loyalist ancestors. More’s the pity. But I have a deep affinity for those whom I frequently meet in the zillions of documents I come across. Lifelong learning is a daily experience (aren’t we lucky?) and rarely stays static. That means if I were to put together such a book again, it might look quite different. I’ve already learned more. Then, the irresistible urge to re-write, re-write, re-write a manuscript, requires a firm voice to call “Enough!” (... enough for the moment, enough till the next time ...). * lastly, in lieu of parents, children, and everyone I ever met, dare I thank my camel Abdul for his ever-solid support and promise of adventure. 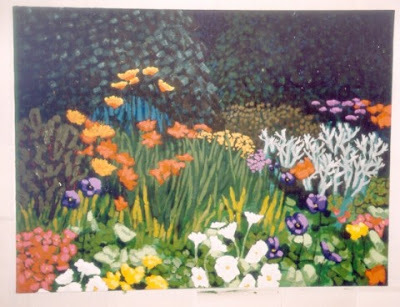 "Flower Field," Painting by CLDM, c2000. Mothers! Mother’s Day is right around the corner and this is the perfect time to honor your mother, grandmother, godmother, step mother, den mother, aunt, neighbor, or friend who happens to be a mother. If you’ve written about your own mother for the COG before, consider writing about another mom on your family tree. Let’s make all our moms famous! My mother died far away at age 57. I was on a different continent at the time and my siblings had to take care of the arrangements. No-one who is over 50 thinks that 57 is “old.” No-one who is under 50 wants to think their mother will die some day. Such were the times and circumstances, I can only remember my overwhelming grief, anxiety and bewilderment pouring out uncontrollably in a washroom at Heathrow airport. Sometimes I think the younger you are when you lose a parent, you are so stunned you have trouble later remembering the funeral and burial details. 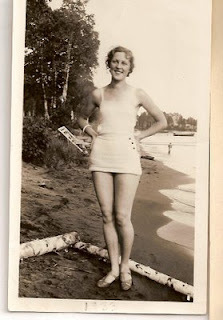 Sometimes I think hardly knew the whole person who was my mother. It takes maturity to recognize a mother as an individual, not “just” a mother who only exists in relationship to the me. Much of it I did in hindsight. We are all less than perfect individuals, even mothers and fathers. Clare was an only child of Latvian descent. She was quite beautiful. Photographs do not capture the distinction of her eyes, one blue and one green. Her parents spoiled her, and also restricted her. She was bright in school—creativity was her forte, in writing and particularly in drawing. Playing the piano and riding horses were other passions. Her heart’s desire to attend art college in Boston or New York, where she had relatives, was strongly vetoed by her father. So she earned a job as a local newspaper journalist in the 1930s, having to content herself with her language and grammar skills. Nevertheless, in a small town, Clare was relatively sophisticated. Her parents and relatives imbued a then-exotic European influence that suited her spirit. Marriage and children somewhat stifled her creative side for a while, unless you count sewing and baking. But she found an outlet eventually in art courses and exhibitions. The hiring of maids (remember DPs? “displaced persons”) and kids off to private schools gave her the chance to step outside the motherhood role. As a widow, she re-focused her energy to steer the family business for a while. Clare had sadness in her life too. Was she mis-matched in marriage? Did she ultimately feel unfulfilled? Did she inherit a genetic predisposition to addiction? She lost her first child. She suffered the poor choice of a second husband. Mom never knew her children succeeded in their own ways; she never knew all her grandchildren and they didn’t know her. We all lost. I don't want to make her famous. I like to think of her best when she felt happy. 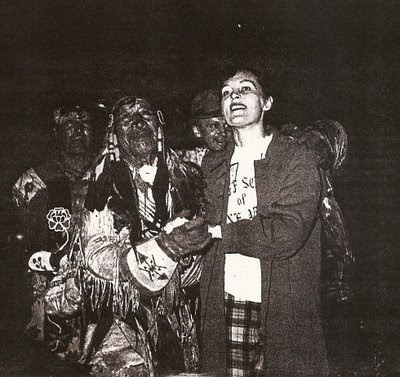 With Chief Walking Buffalo, Banff, 1952; family photograph collection, BDM. One of my past posts commented on an earnest couple of the next generation who underwent a sea change with the birth of their first child. To celebrate the event and hail the new world order, they ditched their family surnames and created a new one. We are told this is being in tune with the planet. Go figure. By the time the baby has grandchildren, a budding family historian could meet a rather high brick wall trying to piece things together. Missing ancestors. Recently I’ve seen a few stories about missing relatives. More precisely, missing remains—the occasional ancestor who obviously died but can’t be found memorialized in a place of burial. Even with a date and/or place of death, some of them defy being found. These are people who are not buried where you expect them to be, or people who are not buried in a family plot, or people whose kin did not place a marker, or people missing in mortuary records. It happened in my family. A rare visit this week with cousins reminded me of what occurred when a favourite cousin died a few years ago. The gathering, as funeral things go, was replete with fond reminiscence and renewal of family ties. We knew that on the morrow we would be at the cemetery after the church service. Most of us didn’t know that we would be burying three people! Seems dearest cousin had been storing her parents’ ashes in the cellar next to her stacks of homemade preserves and jams. And I thought I knew her! Cremation is good. Ashes might be more problematic for the living. The deceased might have made clear wishes to be buried with spouse, parents, children or a specific location. On the other hand, maybe no wishes were spelled out verbally or otherwise. I suppose there could be many reasons why ashes would get carefully set aside or toted around from one home to another. As for the wishes that specify being sprinkled on the ocean or catapulted into space, let’s not go into that in present company. For something like 50 years my aunt and uncle had waited in dim silence. To this day I don’t know if they were neatly labelled on the shelf like their succulent neighbours. Dignity restored.